April 27, 1966: Richard Nixon’s opening arguments during Supreme Court case TIME, Inc. v. Hill, involving issues of privacy in balance with the First Amendment to the United States Constitution and principles of freedom of speech. In 1952, three escaped convicts took James Hill, his wife, and their five children hostage in their Whitemarsh, Pennsylvania, home. After nineteen hours, the family was released unharmed. The convicts were later apprehended in a violent clash with police during which two of them were killed. In 1953, Joseph Hays’ published a novel based on the Hill family’s ordeal. When the novel was subsequently made into a play, Life Magazine (“Life”) printed an article about the play that mirrored many of its inaccuracies concerning the Hill family’s experience. Alleging that it deliberately misrepresented his story, Hill sought damages against Life. On appeal from an adverse ruling, the Appellate Division of the New York Supreme Court remanded for a new trial where a reduced adverse ruling was imposed on Life. Following an unsuccessful appeal in the New York Court of Appeals, the Supreme Court granted Life’s owner, Time Inc. (“Time”) certiorari. 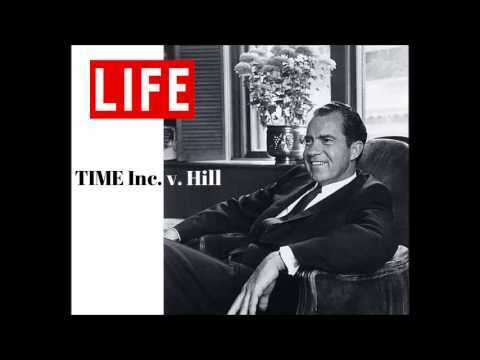 Mr. Nixon argued for the Hill family, stating that a fictional account is not newsworthy, and therefore freedom of the press is not impacted by the privacy law. His essential premise put forth the notion that the “fictionalization” aspect of privacy law did not harm freedom of expression.